You might remember learning all about the electro-magnetic spectrum in school, and how throughout the years it has been engineered into day-to-day technology, almost all of which now depends on electro-magnetic waves in some form. It’s entirely possible that after all the lecturing on radios and microwave ovens, you thought that the door had been closed on research in this field about a century ago. You would be wrong. 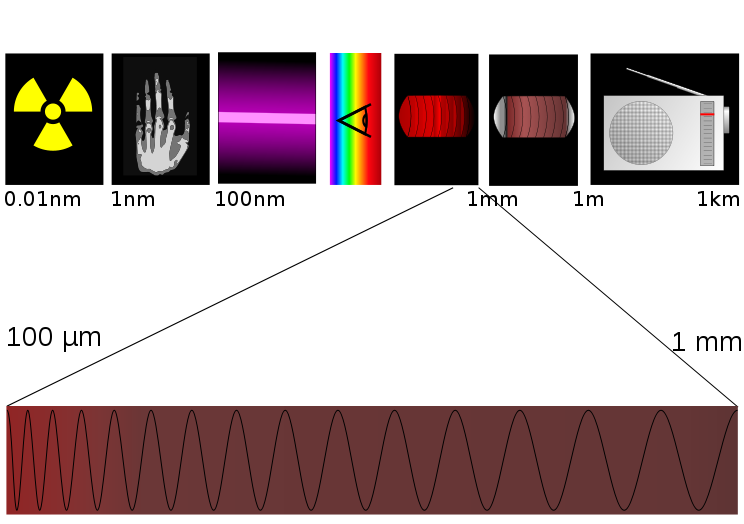 Terahertz (THz) radiation is a part of this spectrum, characterised by a range of frequencies between IR and Microwave radiation (0.3-10 THz, where one THz is equal to 1,000,000,000,000 Hz). It was only in the 1980s, when a new technology was developed that could be used as both a source and detector of THz radiation, that it became viable for researchers to start exploring the properties of the radiation. By this point, it was common knowledge that X-rays could create useful images of the human body, and so it was no stretch of the imagination that the relatively narrow interval of THz could be used to create images in a similar sense. Just as X-rays are absorbed by bone more so than by muscle, different substances absorb terahertz radiation in different amounts. Some of the remaining, unabsorbed rays get reflected, which alters their frequency, and so we can use scans of these rays to build an image. Around 10 years ago, a research team at MIT used THz rays to penetrate a sealed paper envelope; the rays were absorbed by ink more than the paper, so the writing inside was visible on the scan. That is, THz could make it possible to read a letter through the envelope. In fact, THz can be used to distinguish between many chemicals, such as food and allergens (for quality control in factories), or tissue and explosives (for use in airport scanners). The research regarding scanning letters has very recently been expanded upon with an incredible prototype device. The device was used without human supervision, successfully scanning a stack of nine sheets of paper,1 each with a single letter printed on it. The THz scanner exploits the fact that air pockets trapped between the pages of a book have a different density from that of the paper, and so their different refractive indexes cause reflection at the boundary. Since the air-paper boundaries are at distinct radii, the detector was able to differentiate between pages by measuring the “pingback” return time for the THz pulse.2 An algorithm was then used to interpret the distorted scans of each page as distinct letters. There is already a great deal of interest in the potential application of this technology in libraries, where it could read through pages of historical books so as to preserve their spines. Unlike higher frequency radiation such as UV or X-rays, terahertz is non-ionising. When we talk about the danger of X-rays, we are really describing its ability to break molecules into smaller fragments called ions. Ions have an electric charge, and so they react easily with many molecules; inside the body, these chemical reactions can result in cancerous cells developing. THz radiation has a lower frequency than X-rays, and hence it can’t provide the energy required to create these ions. This means that THz can be used in medical imaging through tissue (with a low water content since water absorbs THz), as well as producing clearer 3D models of teeth than the conventional X-ray method. In summary, even though research into the application of THz is modern and still ongoing, it can be explained in terms with a striking resemblance to GCSE science material. A new focus on contemporary, practical applications for THz, and on the young, fresh faces currently working on those uses today, could go a long way to spurring interest among students and scientists for a currently undervalued field. Colm Whitehead is a second year student at Warwick studying Mathematics and Physics.